ROCKFORD, Ill. — Lawrence University’s Nigel Schuster earned all-conference honors Saturday for the second consecutive season to lead the Vikings at the Midwest Conference Championships at Aldeen Golf Club. Schuster carded an 84 in Saturday’s final round on the par-72 layout to finish in eighth place with a 54-hole total of 240. The top 10 finishers constitute the all-conference team. Schuster, who finished third last season, fired a 75 in the first round and 81 in round two. Henry Mulvey of Carroll University won the title at 225 after shooting 85 in the final round. Lawrence shot a team score of 339 on Saturday and finished in seventh place at 1,026. Carroll won the team title at 921. Nathan Ley finished 32nd for the Vikings with a score of 257. Ryan Clark was 35th at 261, Austin Frank was 42nd at 269 and Ryan Eardley was 45th at 283 to round out the scoring for Lawrence. ROCKFORD, Ill. — Lawrence University standout Nigel Schuster stayed in contention during Friday’s second round of the Midwest Conference Championships at Aldeen Golf Club. Schuster is in fifth place after carding an 81 on the par-72 layout. He has a 36-hole score of 156. Carroll University’s Henry Mulvey fired a 3-under par 69 to move to 4-under for the tournament with a 36-hole score of 140. Carroll is dominating the championships after carding a 298 in the second round. The Pioneers have a team score of 601 and are 26 shots ahead of second-place Lake Forest College. Lawrence is in eighth place with a team score of 687 after shooting a 337 on Friday. Lawrence’s Nathan Ley is tied for 36th after shooting 84 on Friday. He has a 36-hole total of 174. Austin Frank is tied for 40th at 177 and Ryan Clark is 43rd at 180. The 54-hole event wraps up on Saturday. ROCKFORD, Ill. — Nigel Schuster is tied for fourth place after Thursday’s opening round of the Midwest Conference Championships at Aldeen Golf Club. Schuster carded a 3-over par 75 on the par-72 layout. Schuster is four shots off the lead of Henry Mulvey of Carroll University. Mulvey fired a 1-under par 71. Lawrence carded a team score of 350, which puts the Vikings in eighth place. Carroll leads the team standings at 303. Round two is scheduled for Friday, and the 54-hole event wraps up on Saturday. 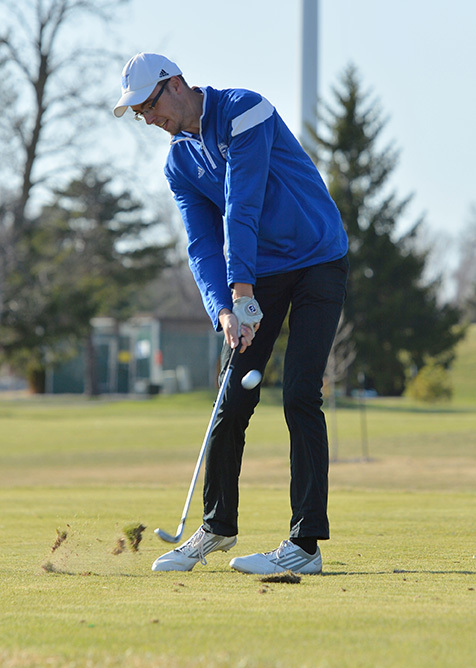 WRIGHTSTOWN, Wis. — Ryan Clark finished in a tie for 23rd place Sunday to pace the Lawrence University golf team at the St. Norbert College Invitational at Royal St. Patrick’s Golf Links. Clark carded scores of 85 and 79 on the par-72 layout to finish with a 36-hole total of 164. Nick Mueller and Joe Scherer of St. Norbert and Lake Forest College’s Ricky Schmidt tied for first place with a score of 151. Rounding out the scoring for Lawrence were: Nathan Ley at 167 (T28), Nigel Schuster at 166 (32nd), Austin Frank at 178 (T40) and Ryan Eardley at 182 (42nd). WRIGHTSTOWN, Wis. — The Lawrence University golf team struggled to a team score of 341 in Saturday’s opening round of the St. Norbert College Invitational at Royal St. Patrick’s Golf Links. Nigel Schuster carded an 84 on the par-72 layout to pace the Vikings. St. Norbert’s Joe Scherer leads the tournament after an opening-round 73. The Green Knights shot 300 and lead the team standings. Nigel Schuster was named the Midwest Conference Player of the Week. APPLETON, Wis. — Lawrence University golf standout Nigel Schuster earned Midwest Conference Player of the Week after carding the low round of his career. A junior from Dusseldorf, Germany, Schuster fired a 1-over par 73 to take second place at the Forester Spring Invitational at Aldeen Golf Club in Rockford, Ill., on April 17. Schuster recorded three birdies on the front nine and went out in 2-under 34. He shot 39 on back nine to finish one shot behind Jordan Velez of Benedictine University, who won the title with a 72. It was the lowest round of Schuster’s career by one stroke. He carded a 74 at Washington County Golf Course back in the fall of 2015 at the Wisconsin Lutheran College Invitational. This is the first Player of the Week award for Schuster, and the first time Lawrence has won the award since Rudi Pino did it in April 2013. Lawrence returns to action on Thursday when it heads to the Oak Brook Golf Club to play in the Elmhurst College Invitational. ROCKFORD, Ill. — Nigel Schuster fired a 1-over par 73 Sunday and took second place to lead the Lawrence University golf team at the Forester Spring Invitational. Schuster finished just one shot behind winner Jordan Velez of Benedictine University, who won the title with an even-par round of 72 at Aldeen Golf Club. Lawrence finished with a team score of 332 to finish 13th, and Carroll University won the title with a score of 308. Nathan Ley carded an 84 to finish in a tie for 46th, and Ryan Clark shot an 85 and tied for 54th. Rounding out the scoring for the Vikings were Ryan Eardley at 90 and Austin Frank at 91. WAUKESHA, Wis. — Ryan Clark tied for 26th on Saturday to pace the Lawrence University golf team at the Wisconsin Lutheran College Invitational. Clark fired an 8-over par 80 on the par-72 layout at Morningstar Golfers Club. Lawrence finished 14th in a tightly-bunched field with a team score of 340. Alex Stewart of Carthage College shot a 2-under par 70 to win the individual title, and Carthage took the team title as well. Nathan Ley and Nigel Schuster both shot 82 for the Vikings to finish in a tie for 45th, and Ryan Eardley (96) and Austin Frank (97) rounded out the scoring for Lawrence.